Will Strikeforce Technologies Inc (OTCMKTS:SFOR) Keep Its Gains? After logging in four sessions in a row of massive gains and reaching a close at $0.003 at the end of last week yesterday the stock of Strikeforce Technologies Inc (OTCMKTS:SFOR) suffered a painful drop. 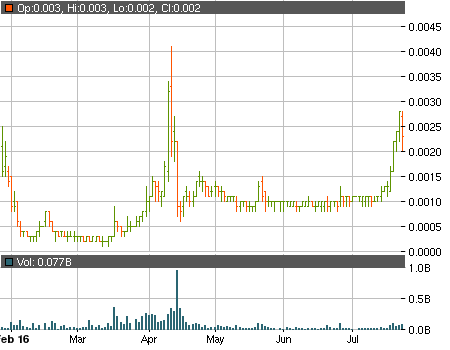 It opened the trading day at $0.003 but it quickly lost its footing and plunged towards the bottom of the chart. When the closing bell rang SFOR were sitting at $0.0023 for a loss of nearly 18%. Will this be a brief step back or is the stock going to wipe even more of its recent gains? Well, there aren’t that many pennystocks that can claim to have won a patent litigation against one of the most powerful corporations in the world but SFOR did exactly that. On January 15 the company settled its litigation against Microsoft Corporation (NASDAQ:MSFT) and in exchange for licensing its patents to MSFT it received a non-disclosable one-time lump sum payment. The quarterly report covering the first three months of the year revealed that the sum was in the amount of $9.75 million. Although at first glance this truly seems as a gargantuan success for the company upon closer inspection things start to look far less impressive. First of all SFOR had to use over $4.1 million in order to pay the fees related to the settlement litigation. That still left them with proceeds of more than $4.5 million and it allowed the company to pay off some of its outstanding convertible debt. The shareholders still suffered through a disastrous amount of dilution, though, when in less than six months the outstanding shares grew from 22.7 million to over 2.2 BILLION. The quarterly report states that by March 31 1.8 billion shares had seen the light of day at prices ranging from $0.000058 and $0.0008 while according to the subsequent events section since the end of the quarter SFOR has issued 313 million shares as a conversion of accrued interest on notes with variable conversion features and 155 million shares as a cashless exercise of warrants. Last month SFOR announced that it has started patent litigation against three new major companies but that doesn’t make the red flags any less serious. If you determined to trade the stock do extensive due diligence before committing to anything.